The simplest way to sum up the greatness of Inception is to identify it as a new classic of science-fiction cinema (and, for that matter, the heist genre). 148 min. Warner Brothers. Director: Christopher Nolan. Cast: Leonardo DiCaprio, Michael Caine, Ken Watanabe, Joseph Gordon-Levitt, Marion Cotillard, Ellen Page, Cillian Murphy, Tom Berenger, Tom Hardy, Lukas Haas, Pete Postlethwaite, Dileep Rao. The first image in Christopher Nolan's Inception is of waves. They are, in a manner of speaking, brain waves, for the movie begins in the subconscious mind. Because Inception is written and directed by Nolan (contributions he has made to films like Memento and The Dark Knight), it goes without saying that it's extremely well thought out. Nolan likes himself a puzzle or, in this case, a maze: the labyrinth of brain tissue that is the architecture of our minds. So, yes, Inception is literally heady fare, the story of a crack team of subconscious infiltrators trained to create vulnerable dreamscapes (the job of an "architect"), plunge into them together via "shared dreaming," and steal ideas ("extraction"). Idea theft is hard enough, but much harder than extraction is "inception": the planting of an idea in such a way as to make the subject believe it is his or her own (we're put in the compromised position of rooting for purveyors of two of the biggest modern bugaboos: these anti-heroes are violators of privacy and identity thieves). 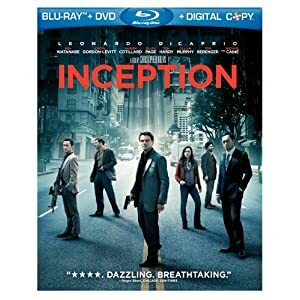 When presented with the prospect of an inception mission, Joseph Gordon-Levitt's extractor Arthur warns, "True inspiration's impossible to fake," but team leader Cobb (Leonardo DiCaprio) won't be dissuaded. The high-risk job is his opportunity to rejoin his children, from whom he has been separated following a tragic incident. Cobb remains haunted by a memory involving the mother of his children (Marion Cotillard), who's always on his mind. What's worse: the intensity of the memory owes to strong feelings of guilt and regret. As Cobb asks and answers, "What is the most resilient parasite? An idea." The simplest way to sum up the greatness of Inception is to identify it as a new classic of science-fiction cinema (and, for that matter, the heist genre). This conclusion would seem hard to dispute, given Nolan's inventiveness and filmmaking skill in telling a story that demonstrates Dickian fascinations with untrustworthy reality, invasive technology, and betrayal that can be internal as well as external. By also functioning as an action thriller, Inception fulfills Nolan's ongoing promise to craft works that are exciting as movies and exciting as films, layered with a Hitchcockian self-reflexivity about the dream escapism of movies themselves (Nolan has copped to Blade Runner, On Her Majesty's Secret Service and Topkapi being among his favorite movies, and their echoes are felt here). Furthermore, Inception makes a bold attempt at tragic psychodrama, not unlike DiCaprio's recent teaming with Martin Scorsese, Shutter Island. The ingenious plot boasts nearly airtight internal logic, especially important when the film dares to climax with a sequence unfolding on four levels of subconsciousness at once. To call Inception ambitious is a no-brainer; Nolan has never dreamed so big, and on the heels of The Dark Knight, the final-cut filmmaker has enough clout and enough of Warner Brothers' dollars to realize his vision with his loyal crew intact (MVP: cinematographer Wally Pfister) and a top-notch ensemble that includes Ellen Page (a brilliant architect), Ken Watanabe (as the client), Cillian Murphy (as the mark), Tom Hardy (who crucially lends a bit of slinky humor to the team effort), Tom Berenger, Lukas Haas, Pete Postlethwaite, Dileep Rao and, fleetingly, Michael Caine. The nearly wall-to-wall scoring contributes to the thick broodiness of the picture; if it weren't for the totemic use of Edith Piaf's "Non, je ne regrette rien," Hans Zimmer would never get a break. France, Morocco, Japan, Canada, the UK and the US provide sites for sore eyes, and the "how'd they do that?" effects work supervised by Chris Corbould and Paul Franklin is strictly mind-blowing movie magic. Nolan busts in the doors of perception, breaks the glass of its windows and mind-warps the laws of physics. Warner delivers Inception to home video for the first time in a three-disc Blu-ray + DVD + Digital Copy combo pack special edition with top-notch tech specs. The lovely hi-def Blu-ray transfer does a bang-up job of replicating the film's theatrical look, giving the picture a satisfying illusion of depth and terrific clarity and detail. The film's color scheme is intact, blacks are deep, and contrast is well defined; textures are likewise life-like. As for audio, it's definitely "reference quality": the lossless DTS-HD Master Audio 5.1 surround mix is a masterpiece of discrete separation and pinpoint clarity, delivering a potent, immersive experience on par with the theatrical one. The Extraction Mode is a playback option that pauses the film at opportune moments and branches out to production featurettes with behind-the-scenes footage and cast and crew interviews. If you're like me, though, you'll prefer the Jump to the Action menu option that allows direct access to the fourteen segments of the Extraction Mode (44:13 with "Play All" option, HD). Interviewed in these featurettes are Nolan, producer Emma Thomas, Leonardo DiCaprio, production designer Guy Hendrix Dyas, special effects supervisor Chris Corbould, stunt coordinator Tom Struthers, visual effects supervisor Paul Franklin, editor Lee Smith, director of photography Wally Pfister, special effects coordinator Scott Fisher, first assistant director Nilo Otero, Joseph Gordon-Levitt, co-producer Jordan Goldberg, and composer Hans Zimmer. The Behind the Story section (59:03 with "Play All" option, HD) comprises the documentary "Dreams: Cinema of the Subconscious" (44:29, HD) and the premiere motion comic "Inception: The Cobol Job" (14:33, HD), which tells the story of Cobol Engineering's hiring of Cobb, Arthur and Nash. The documentary, produced in collaboration with Gordon-Levitt's online collaborative production company HitRECord, finds the star as host for a sprawling consideration of the science and mystery of dreams. Nolan turns up to explain his take on dreams, as do DiCaprio, Stanford Professor of Behavioral Sciences and Sleep Medicine William C. Dement, M.D., Ph.D; Grant MacEwan University Professor Jayne Gackenbach, PH.D; Deirdre Barrett, Ph.D. of Harvard Medical School; UC Sanat Cruz Resident Professor in Psychology and Sociology G. William Damhoff, PH.D; the Lucidity Institute founder Stephen LaBerge, PH.D; Harvard Medical School Professor of Psychology, Emeritus J. Allan Hobson, M.D; psychiatrist Judith Orloff, M.D; and dream testifiers Kali Bernard, James Brown, III, Maria D. Hernandez, Bronson Page, Lynarion Hubbard, Alexandra Broudy, and Saqi Syed. Project Somnacin: Confidential Files is a BD-Live feature allowing the viewer to "access highly secure files that reveal the inception of the dream-share technology." "5.1 Inception Soundtrack" (38:38 with "Play All" option) delivers, in lossless sound, ten music cues from Hans Zimmer's soundtrack. Lastly, in Extras, you'll find a Conceptual Art Gallery (HD) with over thirty slides of pre-production art, Promotional Art Gallery (HD) with posters and such, three "Trailers" (4:50, HD) and thirteen "TV Spots" (11:28, HD). Fans of one of the year's top films won't be disappointed in Inception's home-video debut, especially in its value-packed, hi-def Blu-ray incarnation. All site content © 2000-2019 Peter Canavese. Page generated at 04/19/2019 02:31:02AM.